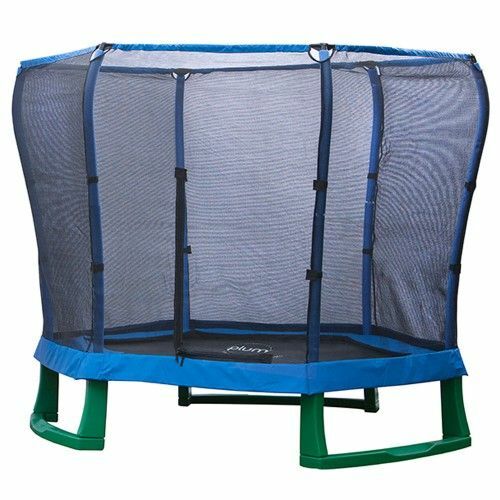 The Plum junior jumper 7ft trampoline is a unique design with cool blue plastic mouldings, padding and a black safety enclosure, this trampoline is a very popular choice for children aged 3 - 10 years. The low height frame makes it easy for little ones to get on and off and the new Plum Safespring technology ensures the user cannot come into contact with metal parts and springs. Plum Products are specialists in providing children and adults imaginative and creative trampolines and have over 25 years of experience. Click on the following link to see more of the Plum trampoline range. We believe that the junior jumper trampoline and enclosure from Plum will allow you and your children to spend hours of fun outdoors. For any further information regarding this Plum Junior Jumper 7ft trampoline, please call 0333 3660062 or you can email sales@trampolinesonline.co.uk. Needless to say, that Trampolines Online is the top leading suppliers of online trampolines for sale.